The Royal Warrant, granted by Her Majesty Queen Elizabeth II in 1955 authorises the Company of Pikemen & Musketeers to parade no more than 63 members at any one time, that being the size of a company in the 17th century. A Company comprises six officers– the Captain, Lieutenant, Clerk and Adjutant, Ensign of Pikemen, Ensign of Musketeers and Quartermaster. Non-commissioned officers include the Elder Serjeant (a 17th century equivalent of the company sergeant major), the Serjeant of Pikes, Serjeant of Muskets, Elder File Leaders and File Leaders. The balance are pikemen and musketeers. Only veteran members of the HAC who have had proven efficient service in the HAC’s Army Reserve Regiment are eligible to join the Company of Pikemen & Musketeers. All join in the lowest rank, regardless of any previous military rank held. Members must be fit enough to competently complete the march of the Lord Mayor’s Show. Military medals and insignia are permitted to be worn. 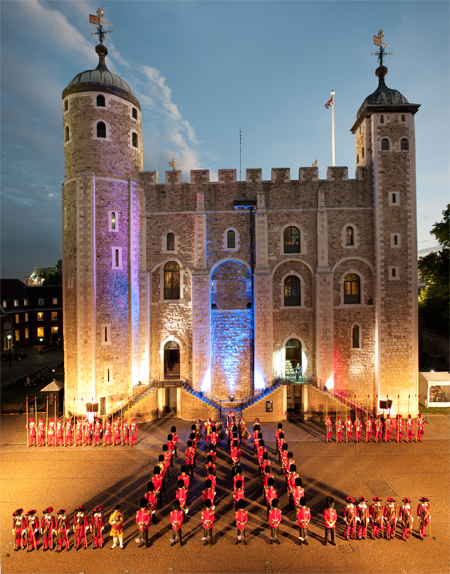 Members are unpaid but give freely of their own time for drill practice and rehearsals as well as the parades and guards themselves. All make a significant contribution towards the cost of their own uniform and are expected to clean and look after their armour, muskets and other kit to maintain the highest standards of turnout for the many prestigious occasions they parade for. The uniform members of the Company wear is identical to that worn by the HAC in the reign of Charles I. It comprises Venetian red tunics with white linen collars and cuffs and knee-length breeches. The seniority of officers and non-commissioned officers is signified by the amount of lace worn on collars and cuffs; the more lace the more senior the rank. Officers wear thigh boots and spurs. 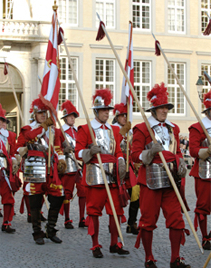 Pikemen wear steel half-armour of back and breast plates with tassets and a morion (steel helmet). The weight is about 18 lbs. They are armed with swords and pikes. The latter would originally have been 18 feet long but for reasons of practicality 12-foot pikes are used today. Musketeers wear a buff sur-coat and wide-brimmed black felt hat. They are armed with a match-lock musket and rest and wear a leather cross belt, from which are suspended 12 wooden powder flasks known as apostles. 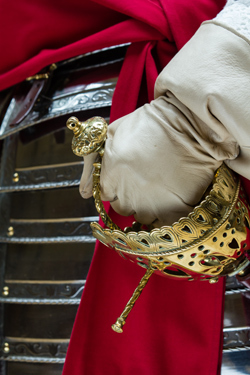 Uniform costs about £1,250 for each new recruit and a new suit of armour about £1,700. Muskets cost about £2,500 each; a number of new muskets have recently been presented by past and present members and City livery companies. The Worshipful Company of Glovers has presented officers’ gauntlets.